Our tamper evident labels are printed on a special vinyl (oracal® 820 safety vinyl) that is impossible to remove. These tamper labels are also known as “egg shell” labels as they are brittle like egg shells. If you attempt to remove the label after applying it to a clean smooth surface, it can only be only be picked off in tiny pieces which makes it impossible to reapply. 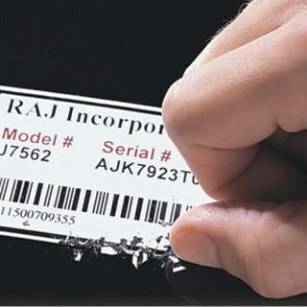 It's the ideal way to prevent unauthorised transfer of labels eg. permits and certificates, or opening of goods to void warranty. Examples of common uses are the back of computer cases and other electronic equipment. Our tamper evident labels can be printed in any colour and available in different shapes and sizes. If you require a size not shown, just email or call us for a price!